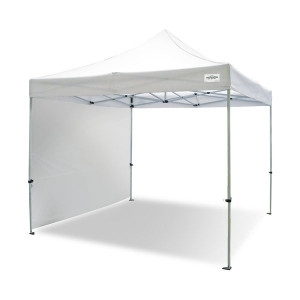 The TitanShade™ is a light-duty, steel commercial grade instant canopy. The durable device is designed for use at outdoor venues, such as street fair vendors, farmer’s markets, tailgaters, work crews, and small business applications. Supplemented by a heavy-duty polyester top, full truss system, color coded patented pull-pins, and Bigfoot® foot-pads, the TitanShade™ becomes an effective shade barrier that is made to withstand repeated use. It comes with a portable carry bag for easy transport.